Yesterday we had a little break from our February Challenge but now we’re back down to business! 🙂 I’m still recovering from those lovely Guy pictures. Today’s images are at the recommendation of Ania. She submitted four pictures and I decided to use all of them for this Flash banner with sound. Thanks very much for your input, Ania! 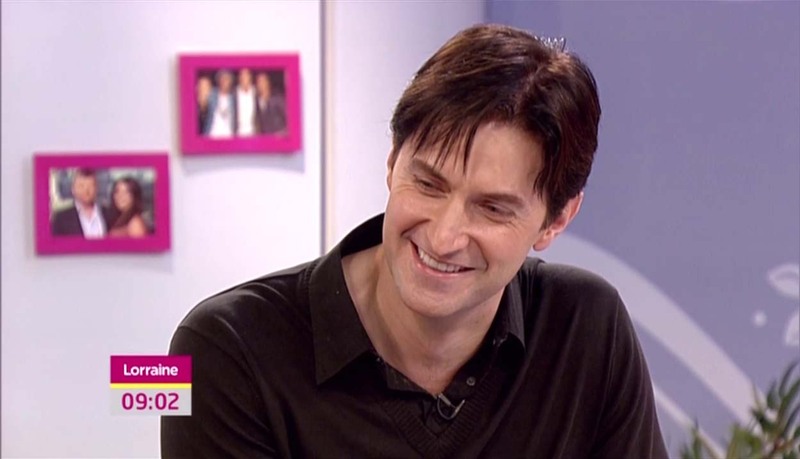 The image above comes from Richard Armitage’s interview on the Lorriane Show in 2010. A complete gallery of screencaps can be found at RichardArmitageNet.Com. Today’s Flash banner contains a music clip from the song “1983” by Neon Trees. To access the banner, please click the image or text link below. How did Thursday get here already? See you tomorrow! This entry was posted in Animated GIFs, Flash, Graphics, richard armitage and tagged actor, flash, flash animation, john thornton, lucas north, MI5, north & south, richard armitage, richardarmitagenet, richardarmitagenet.com, richardarmitagenetdotcom, spooks. Bookmark the permalink. Yes , especially if the man is Richard and if it’s in your kitchen (dream again)! When Lorraine ask him if he cooks he tells her that he chop (I think that is the word he says) and the way he’s choping is very …you know what I mean. 4 Richard in one ! Thank you Bccmee. Richard have a wonderful smile and seems to be the boy next door (I’m dreaming , because my real boy next door is a grand-father of 75 years old , good neighbour but not my cup of tea , LOL) , good choice Ania. Thanks for this – its sooo lovely. These little gems are keeping me sane during this RA drought! Love it! 4 in 1 yay!!! I’m at work, so I put my headphones on, and almost jumped out of my skin when the flash banner started. I don’t know why I thought this was going to be a calm one … then I noticed your words “1983 by Neon Trees” I should have known better and read everything you say before I hungrily click on the link. LOL! Is he wearing a jumper over that shirt? Didn’t notice that before! I’m not familiar with some of the above expressions but the clip is lovely! Lovely choice of pictures, Ania! Love the flash banner, Bcc Mee! BCC, it was worth waiting six hours to see the flying banners… As some people said: 4 Richards in 1 is fantastic!!! Thanks Ania for the beautiful choices and thanks BCC for the endless imagination!!! Great choice Ania, love the part when he chops the herbs, *swoon* close up’s of those delicious long fingers! 4 in 1 flash banner- woohoo good work B! Wow, delicious!! Thanks so much, as always! *sigh* I think it’s so much fun to see RA on the talk shows and in this interview we had the added bonus of watching him chop and taste foods in the kitchen! The director and camera operator did a good job zooming in on those lovely fingers and hands! And let us not forget RA’s dazzling smile! Yes, he’s wearing a black sweater over a black shirt. Thanks again to Ania for submitting four great screencaps. I got the idea to use multiple screencaps because of the little framed pictures in the background of the interview screencap. I wanted things “dropping in” and then the flying banners banner idea happened, LOL. The song was a bit loud but I wanted something a bit cRAzy that contrasted with the images, hehe. For those of you curious, the 4 screencaps are: Lucas, Thornton, Thorton again, and of course RA himself. RA in a kitchen? MIne, hopefully. Ha! Great pix and flash and song! Thanks Bccmee and Ania!